Austal (ASX:ASB) has launched the first of two 72m High Speed Support Vessels (HSSV’s) being built for the Royal Navy of Oman (RNO), yesterday. Hull 390 - the future RNOV Al Mubshir - was successfully launched after 13 months of construction and fitout at the company’s Henderson, Western Australia shipyard. Austal Chief Executive Officer Andrew Bellamy said the on-schedule launching of the first HSSV demonstrates Austal’s proven capability to design, construct (and support) large, multiple naval vessel programs; locally, globally, successfully. “Our track record here in Australia and overseas clearly supports Austal’s strong proposition that we can effectively and efficiently deliver the Australian Government’s Future Frigate and Offshore Patrol Vessel programs,” Mr Bellamy added. Based on the proven Expeditionary Fast Transport (EPF) platform - previously known as the Joint High Speed Vessel (JHSV) - the HSSV offers a range of capabilities to support naval operations, including helicopter operations, rapid deployment of military personnel and cargo, search and rescue operations, humanitarian aid and disaster relief missions. 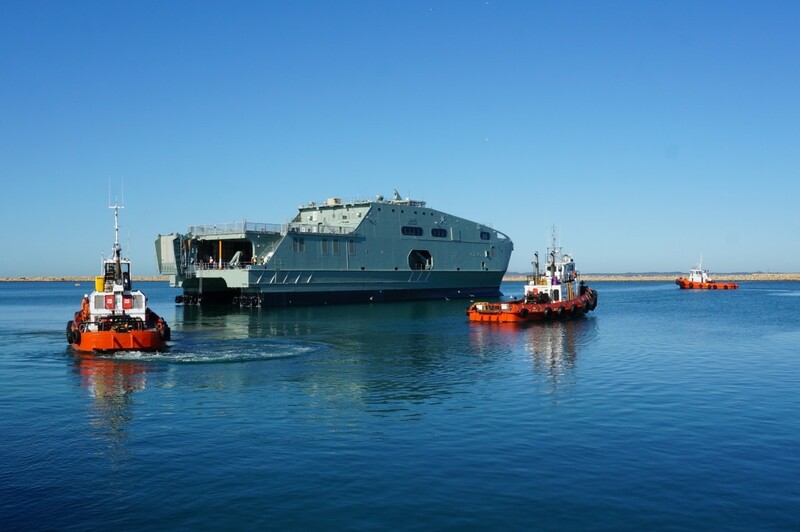 Austal was awarded the US$124.9 million contract for the design, construction and integrated logistics support of the two HSSV’s in March 2014 and construction commenced in August 2014. This first HSSV will now complete final fitout before sea trials, prior to delivery to the RNO early in 2016. The second HSSV is under construction and is on schedule for completion in mid 2016. Defence vessels designed and built by Austal include multi-mission combatants, such as the Littoral Combat Ship (LCS) for the United States Navy and military high speed vessels for transport and humanitarian relief, such as the Expeditionary Fast Transport (EPF), previously known as the Joint High Speed Vessel (JHSV), for the United States Navy and High Speed Support Vessel (HSSV) for the Royal Navy of Oman. Austal also designs, constructs, integrates and maintains an extensive range of patrol and auxiliary vessels for government agencies globally, including the Cape Class Patrol Boat Program for Australian Border Force. Defence vessels are designed and constructed in Mobile, Alabama and in Henderson, Western Australia. Austal provides a wide range of support services, including through life support, integrated logistics support, vessel sustainment and systems support. These services are delivered through our global support network in the USA, Australia, Asia, the Middle East together with partner shipyards worldwide.